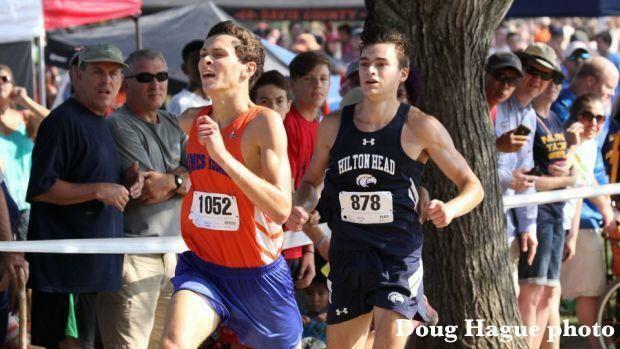 A pack of 20 remained together at the hill during the Providence Invitational race that included Hilton Head's Ben Gilman, James Island's Dolan Owens and Riverside's Ben Cignarale. Gilman had a slight lead after emerging from the lake, ncrunners reported. The final stretch consisted of Gilman and Owens going back-and-forth with Owens winning in 16 minutes, 10 seconds to Gilman's 16 minutes, 11 seconds. Gilman's brother, Sam, finished fourth in 16 minutes, 19 seconds. Hilton Head boys finished third in team standings with Riverside fourth. Hilton Head girls finished with a team score of 71 points over second-place Green Hope (N.C.) (108). Hilton Head's Mallory Liggett finished sixth in 19 minutes, 39 seconds.